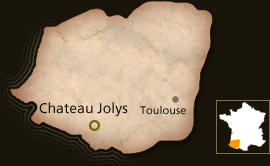 Fanciful, voluptuous and wonderfully rounded – Château Jolys wines will take your senses to a higher level! Château Jolys, the biggest private estate in the Jurançon appellation, came into being in 1936. The vines are planted on steep slopes that form large amphitheatres and offer a panoramic view of the majestic Pyrenees mountains. Our vineyards, home to our Petit Manseng and Gros Manseng grapes, lie on the hillsides of the well known Chapelle de Rousse terroir. They guide our gaze to the South, toward the peaks and the blue summits of the Pyrenees. Here, Mother Nature is our ally; we have an unspoken agreement with her and we live and work hand in hand with her. Our Jurançon wines are lively, crisp yet structured, thanks in part to the Chapelle de Rousse terroir, which is uncharacteristic of the Jurançon appellation. Jurançon, the wine of kings and poets. « In my youth I met a fiery prince, masterful and treacherous like all great seducers, like Jurançon wine »– Colette. The first written references to Jurançon vines date back to 998. The Navarre royal court invested in the development of the Jurançon vineyards and this association lent a certain prestige to these wines. Indeed, Jurançon entered History on December 12th 1553, when this wine was used to anoint the baby King Henry IV at his christening. The château dates from the 16th century and was renovated during the 19th century. This handsome period property, which may have been used as an observation post, is perched on a peak in the foothills of the Pyrenees, and despite its elegant appearance, is first and foremost a home where a warm welcome is always to be found. Two 18th century cellars stand either side of the courtyard; both house and cellars form the heart of the estate, and appear on all our labels. Pierre-Yves Latrille, an agricultural engineer, bought the estate over 40 years ago. The land was fallow, but he found the site so delightful, so peaceful, that he felt compelled to undertake the labour of love that transformed this wilderness into a 36 hectare vineyard, of which 3 hectares are given over to Chateau de Jurque. His daughter, Marion Latrille, having obtained her diploma in viticulture and oenology, as well as a Masters degree in management, joined her father on the estate in 1999. In 2012, his granddaughters Camille and Claire joined forces with him, bringing with them their energy, ideas and projects. Camille is in charge of the business and marketing side of things, while Claire looks after the vineyards and the winemaking. To us, hand harvesting is essential; as far as we’re concerned it’s the best way to preserve the grape, from the vine to the vat. Our harvest period can last from mid October until the end of the first week of January! Parcel selection allows us to determine and express the originality and characteristics of our wines. Skin fermentation means that the grapes need to be in perfect condition; as my father is fond of repeating, ‘you can’t make good wine without good grapes’! • the Foehn wind, essential to the passerillage (drying) of the the gros and petit manseng grapes. The Foehn reaches us from Spain, and from October onwards, the warm morning breeze it brings to the vineyards favours the concentration of the sugar and natural acids in our grapes, thus taking an active part in creating harmonious wines. We let our grapes dry on the vine; we harvest in several stages and leave the best bunches to surmature and turn brown at their own rhythm, still nourished by the vine; this is vital to us. When the Pyrenean mountain range was formed, the height of the plateau that bordered the Pyrenees was raised, thus leaving sparse soils with little lime, perfect for growing vines. Our soils are rather diverse, with varying levels of silica and clay, and lots of morainic stones, known as pudding stones, due to rockslides during the formation of the Pyrenees.These are perfect vineyard soils, since they are sparse and enable the deep root development of the vines. You can’t make a good wine without good grapes … especially when we carry out pre-fermentary maceration. My father always advised me to keep my eyes open and look around me, to observe the vines, how they evolve (strength, color), but also to keep in mind the big picture of what we want to do and how we want to do it. Studying the vegetative cycle, treading the soil, smelling the buds from the vines, determining its strengths and weaknesses, its colour, anticipating in order to better protect, understanding that wine is made first and foremost in the vineyard, not in the cellar, accompanying it from the first leaves to harvest…..everything is visual, tactile, sensitive. We are alert to Nature, to our terroir, and fiercely determined to relay the emotion that each vintage procures. Bright yellow colour with greenish tints. The nose is elegant and intense, with both floral and fruity aromas : honeysuckle, jasmin, grapefruit, citrus and fresh grape. On the palate, the wine is fresh, fruity and rich at the same time. The finish is long and fleshy. 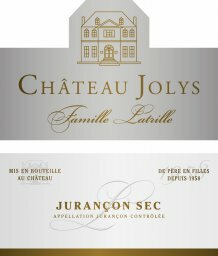 Terroir: Château Jolys, the largest estate in the Jurançon AOC with its 36 hectares, nestles on the superb hills of Chapelle de Rousse village. The gentle slopes are exposed South / South-West and form amphitheatres facing the Pyrenees moutains. Soils are chalky and clayey. Grapes: This dry wine is elaborated using 50% Gros Manseng grapes blended with 50% of Petit Manseng from the first harvest. Wine making: After full destemming, the grapes undergo a pre-fermentary pellicular maceration followed by a gentle pressing. This is followed by racking of the must at low temperature and the alcoholic fermentation. All the vinification process occurs in temperature controlled stainless steel tanks. The wine rests until the following Summer before being bottled. The nose presents notes of honey, acacia, medlar, apricot and peaches. On the palate, after a fresh and round attack, we find the same aromas and compelxity as with the nose. The palate is powerful yet smooth – Petit Manseng at it’s very best. Cuvée Jean can be drunk young or cellared for up 10 years. It’s best served as an aperitif, with foie gras or smoked salmon, and also pairs perfectly with creamy fish and poultry dishes as well as cheese. 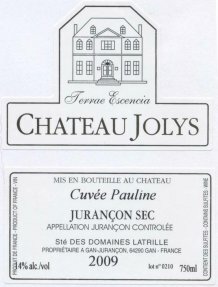 Terroir: Château Jolys, the largest estate in the Jurançon AOC with its 36 hectares, nestles on the superb hills of Chapelle de Rousse village. The gentle slopes are exposed South / South-West and form amphitheatres facing the Pyrenees moutains. Soils are chalky and clayey. 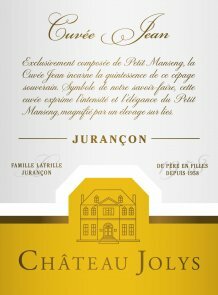 Grapes: Cuvée Jean is made from 100% Petit Manseng grapes. The grapes are surmatured using the passerillage method, and the resulting concentration of sugar gives for perfectly healthy, golden and extremely ripe grapes. Wine making: After total destemming and maceration before fermentation, we keep only the free-run juice to make this wine (juice obtained before pressing), in order to obtain the best of the richness and the aromas of the Petit Manseng grapes. After cold settling, alcoholic fermentation is carried out in temperature controlled stainless steel tanks (at around 20°C so as to preserve the aromas). Barrel ageing for 9 months in French oak barrels.